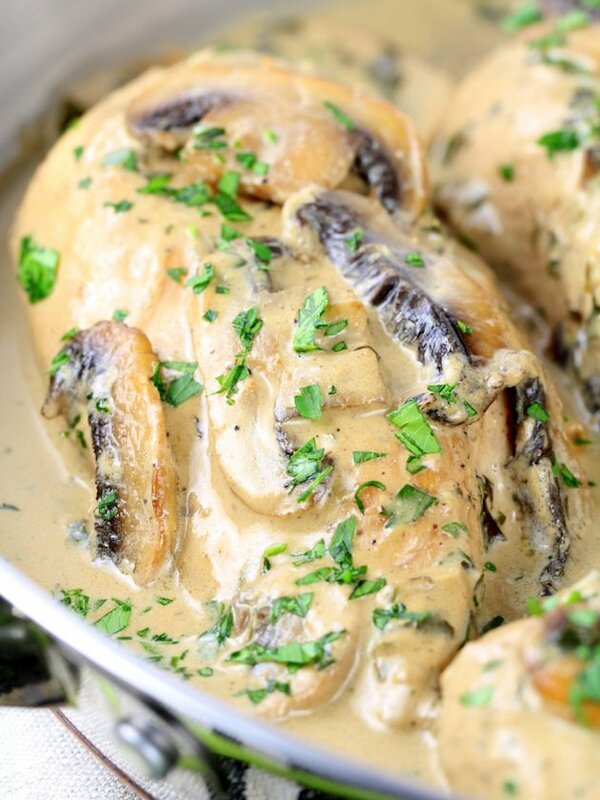 Chicken With Creamy Parmesan Mushroom Sauce - NO cream! 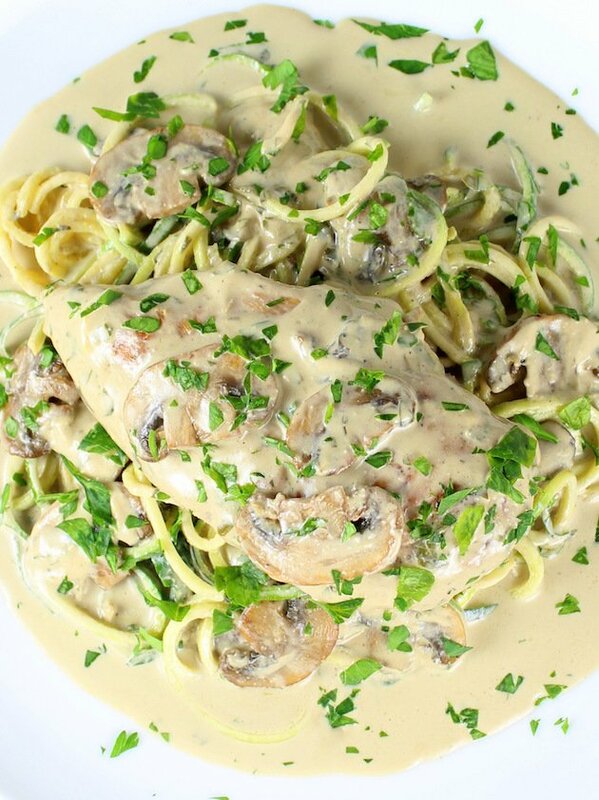 Chicken with Creamy Parmesan Mushroom Sauce – sautéed chicken breast in a creamy cheesy savory sauce with no heavy cream! It’s full of tender chicken, mushrooms, chicken stock, cream cheese, Parmesan cheese, Worcestershire sauce, fresh parsley, onion and garlic powder. When I think about a creamy mushroom sauce my mind automatically goes to childhood memories of Campbell’s Cream of Mushroom Soup. Can you relate? And whether it was used to make green bean casserole or just heat and eat straight from the can, I think many of us grew up with it as a staple in our diets. Don’t worry, I’m not using it in my recipe today – just having a nostalgic moment over here. Today’s mushroom cream sauce is made with fresh sautéed mushrooms, chicken stock, cream cheese, Parmesan, Worcestershire sauce, and some herbs and spices. 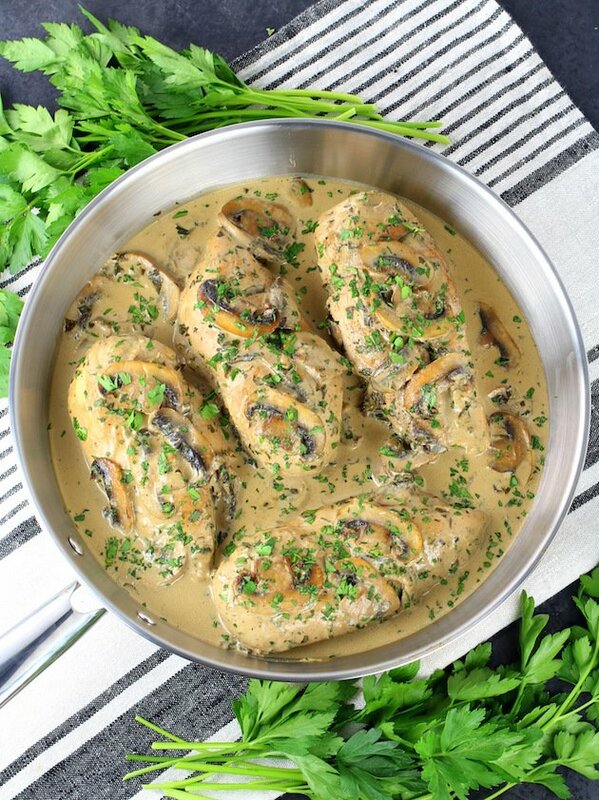 It is so flavorful and the perfect creamy mushroom sauce for chicken. 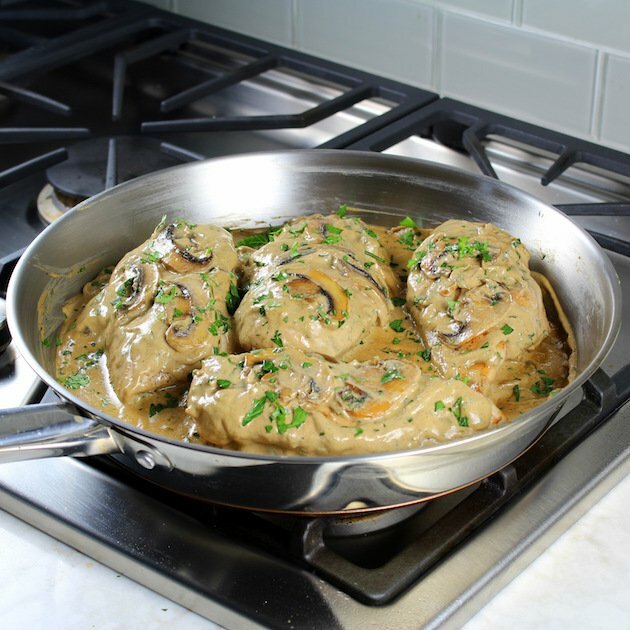 Yes, I do believe the two were meant to comingle in the same pan to create a delicious and creamy chicken and mushroom recipe like this Chicken with Creamy Parmesan Mushroom Sauce! It is sooo good my friend! I’m drooling all over my computer just thinking about it. I understand that many people don’t appreciate mushrooms as much as I do. I think it’s a texture thing that probably turns them off. I for one love their savory umami flavor and how they become a sponge to soak up the tastes that surround them. Mmm, mmm… I am a major mushroom fan! But wait, there’s more… There are numerous vitamins in mushrooms! They are a good source of potassium. In fact 5 white button mushrooms have more potassium than an orange. 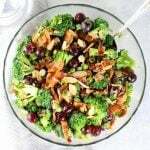 They are also a good source of copper, niacin (vitamin B3), pantothenic acid (vitamin B5), potassium, phosphorus, and iron, depending on the variety. Mushrooms can also be excellent sources of vitamin D if they have been exposed to ultraviolet light right before or after harvesting. How many calories in mushrooms? One cup of raw mushrooms contains only 15 calories. How many carbs in mushrooms? Mushrooms are actually a low carbohydrate food choice. One cup of raw mushrooms contains just over 2 grams of carbs. Is there fiber in mushrooms? Mushrooms are a good source of certain soluble fibers. The net carbs, after subtracting fiber, is 1.6 grams per cup. Is there protein in mushrooms? Mushrooms do provide just a bit of protein – around 2 grams per cup. Fresh whole mushrooms last in the fridge for 4-7 days. Fresh sliced mushrooms last 1-2 days. Cooked mushrooms last in the fridge 3-5 days, and 10 to 12 months in the freezer. 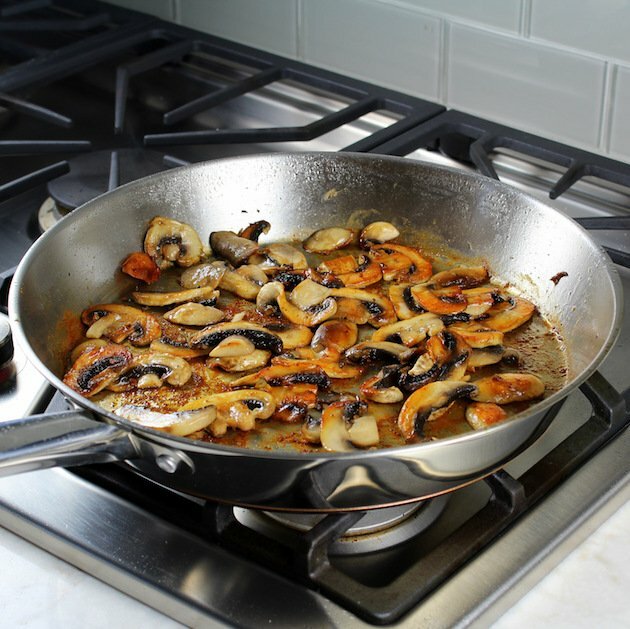 Discard the mushrooms if they become slimy, discolored and have a funky smell. 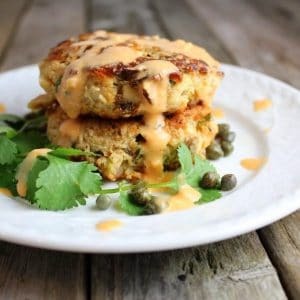 Who knew that these little savory sponges were so good for us?? I’m thinking I need to be eating them more often – how about you? And quite honestly today’s Chicken with Creamy Parmesan Mushroom Sauce needs to go to the top of your must-make mushroom dish list! 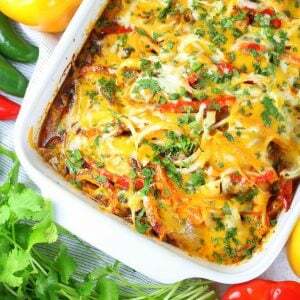 It’s creamy and cheesy and all kinds of savory hearty yumminess! 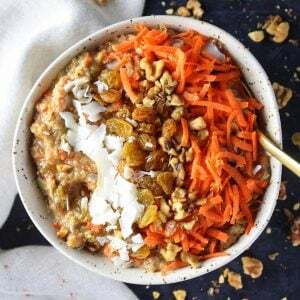 The recipe requires less than 30 minutes and would be delicious served over some zucchini noodles, spaghetti squash, quinoa, pasta and of course rice. 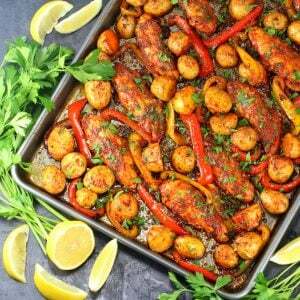 You start by sautéing some seasoned chicken breasts over medium high heat for 4-6 minutes per side, depending on the size of your chicken breasts. The chicken breast cooking temp you’re looking to achieve is 165 degrees. 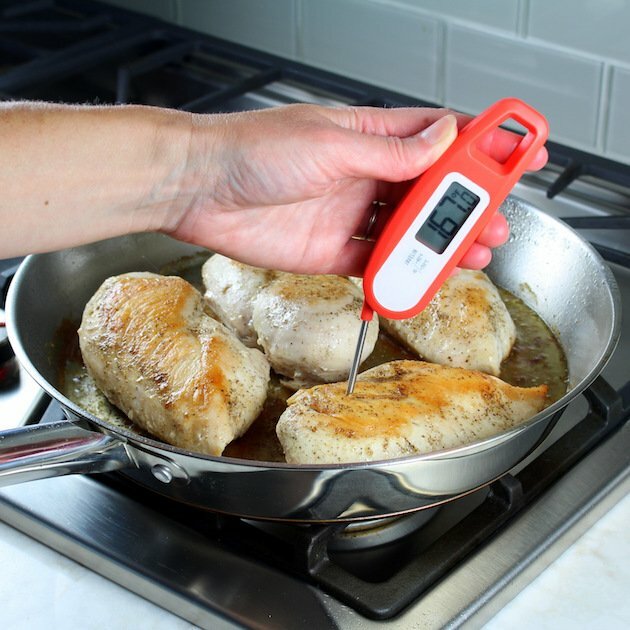 You can use a digital meat thermometer (<- my fave!) to take all the guesswork out and deliver moist tender chicken every time. Next, you sauté your sliced mushrooms for about 3 minutes, flipping to brown both sides. Then set aside with the chicken. Next add the Worcestershire sauce, garlic and onion powder. Then stir in the cream cheese and Parmesan cheese until it creates a creamy sauce. Then add the parsley, cooked mushrooms and chicken back into the pan and coat with the sauce and serve! 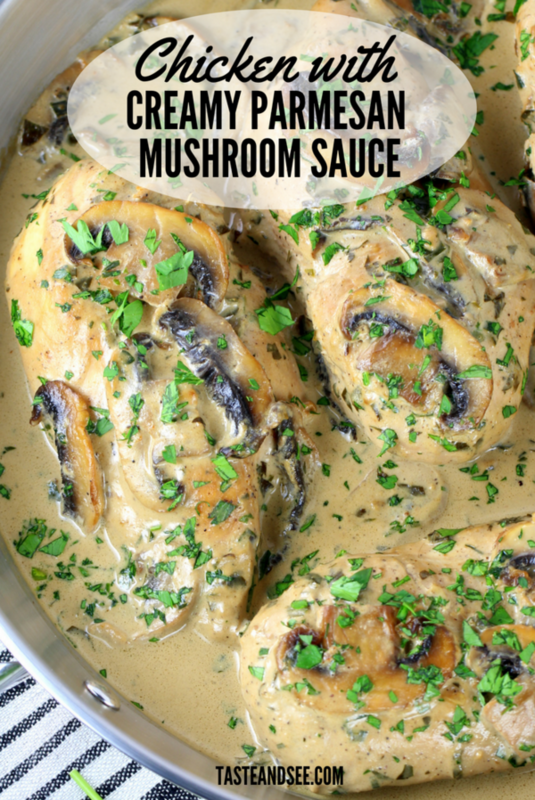 Chicken with Creamy Parmesan Mushroom Sauce – a delicious and easy chicken breast dinner full of all kinds of delicious savory goodness! A super easy weeknight dinner recipe full of tender chicken, mushrooms, and cheese! 8 ounces cream cheese I used full fat but you can use low fat if preferred. Season chicken breasts with salt & pepper, then sauté in olive oil over medium high heat for 4-6 minutes per side, until the internal temp reaches 165F. Remove chicken and allow it to rest on a plate. Sauté sliced mushrooms for about 3 minutes, flipping to brown both sides. Set aside with the chicken. 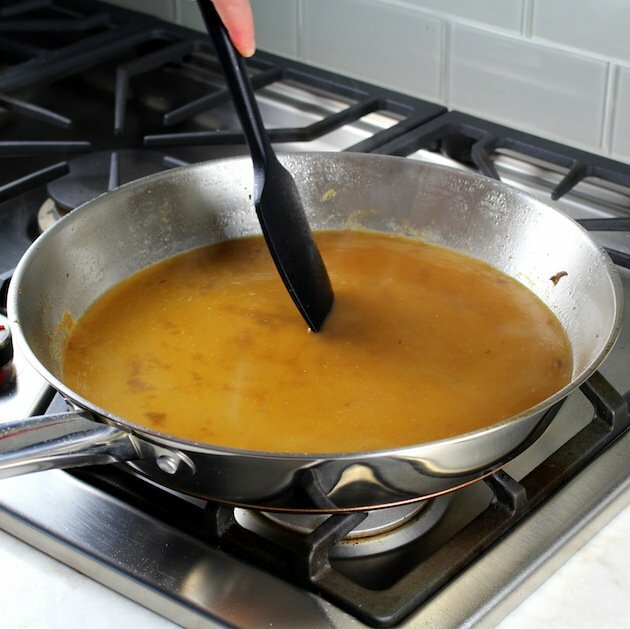 Add chicken stock and deglaze the pan (just heat up the stock a bit, and use a spatula to loosen any of the cooked residue on the bottom of the pan). Add Worcestershire sauce, garlic powder, and onion powder. 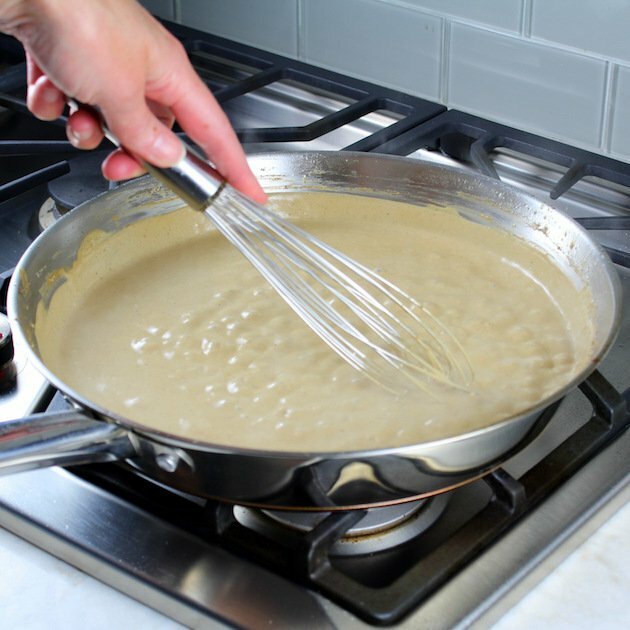 Stir in the cream cheese and Parmesan cheese until it creates a creamy sauce. If the sauce is too think add a little more chicken stock. 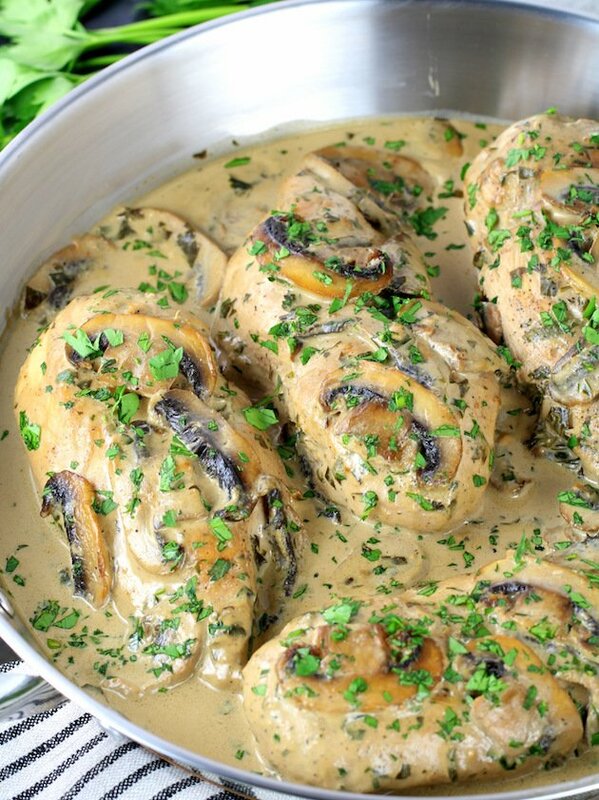 Add parsley, cooked mushrooms, and chicken back into the pan and mix together, coat with sauce, and serve. Serve over zucchini noodle for a satisfying low-carb dinner! Add more chicken stock if the sauce gets too thick or to reheat. Looking for more easy weeknight chicken dinner recipes? 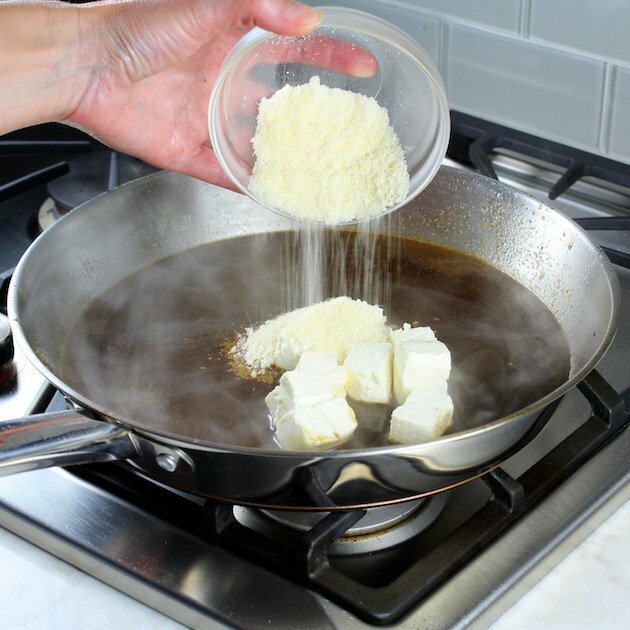 Do you use fresh Parmesan or from the container, grated? I use the fresh grated Parmesan cheese sold in the specialty cheese area at the grocery store. You could always grate it yourself though. Oh this looks just beyond delicious. So creamy and so flavorful. I bet my family will LOVE this. I’m saving this and putting on my dinner menu for this week. Love the mushrooms this time of year! That’s so awesome, Natalie! Thank you! I agree – Fall and mushrooms seem to go hand and hand. 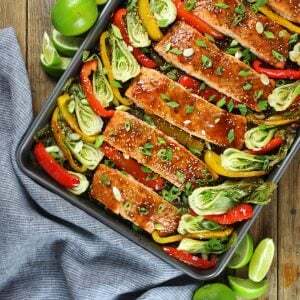 this looks so beautiful and easy to prepare. am surely trying this one over this weekend . It is extremely easy, Aditi! I hope you enjoy it as much as we do! And thanks so much! Wow, this chicken looks amazing, especially that sauce! I am pinning this to try this soon! Yayyy! I love to hear that, Sam! Thanks so much! I know I should give mushrooms a chance. I know they are healthy but for me its a texture thing. This dish looks delicious in any case. 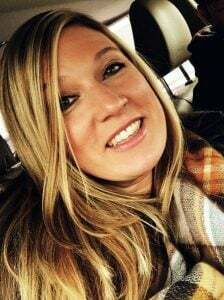 Thank you, Nicole! i understand the texture thing – many people share your same feelings. Lovely pics and looks so delicious. I am totally in love with the sauce. So yummy! Aw thank you, Sri! The sauce total makes the dish! This looks super creamy and delicious. Everything looks perfectly cooked. Thank you so much! It’s real creamy with lots of savory and umami flavors! Thanks a such, Tammy! 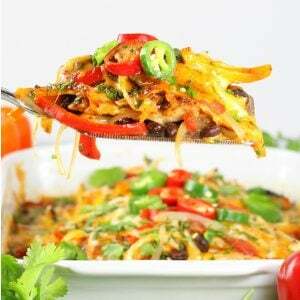 It is a real cozy fall dish! I am a sucker for mushrooms myself, high five! It’s chanterelle season now and I’m all excited about that!! Anyway Worcestershire sauce is really awesome in creamy sauces. 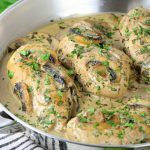 I had no idea it was such a powerful ally in this kind of recipes until I started making Swedish meatballs in the traditional cream sauce and learned that Worcestershire sauce is key in that. It’s really awesome and it makes a world of a difference! I completely agree, Eva! 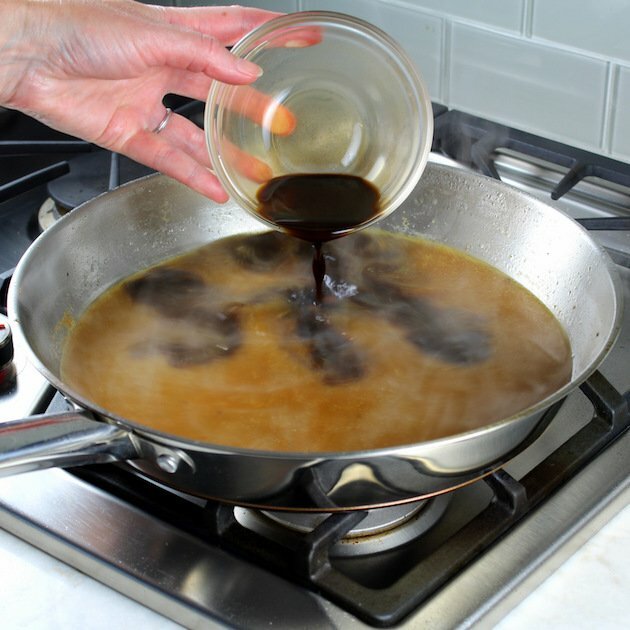 Those savory and umami flavors of the Worcestershire sauce pair perfectly with mushrooms and chicken! Thanks for the 5 stars! LOVE this looks absolutely beautiful! I love how creamy the sauce is! mushrooms and chicken so so well together! Thanks so much, Georgie! I agree – mushrooms and chicken were made for each other! 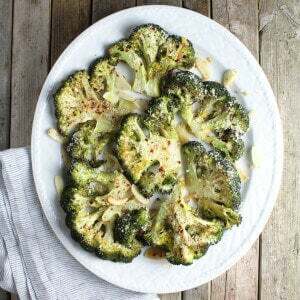 This looks like a future dinner staple! 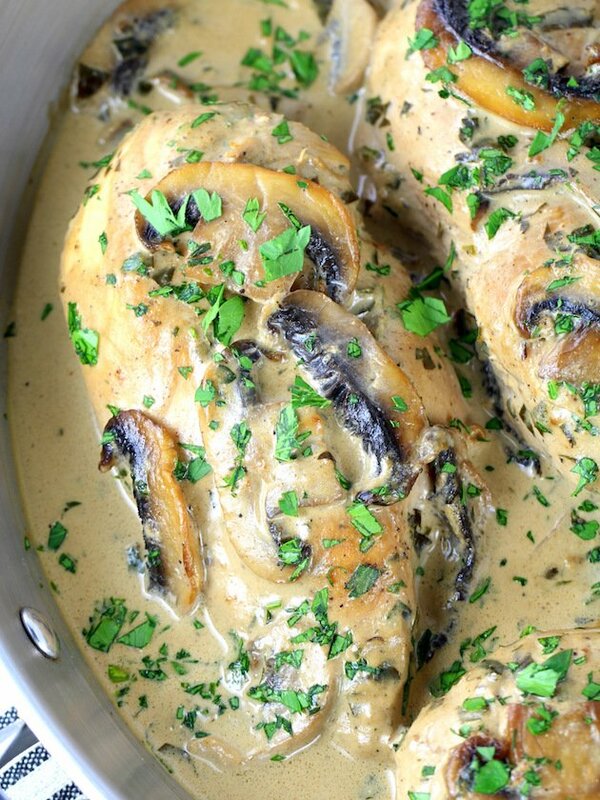 Love chicken with mushroom sauce and parmesan makes it better, I bet! Also, I really appreciate the info about mushrooms! I love mushrooms! That sauce has me seriously drooling. I’m a veggie so I’m gonna try this sauce with pasta or maybe just with some mashed potatoes Great recipe. I think that would be a delicious way to enjoy this sauce! Thanks so much, Michelle! Giiiirl, this looks so good. My husband is allergic to mushrooms but I love them so this is seriously making me drool. Saving this recipe for the next time he’s out of town!! I like how you think, Lauren! This combo is so good! I hope you love it as much as I do! Oh yummmm that sauce looks amazing! 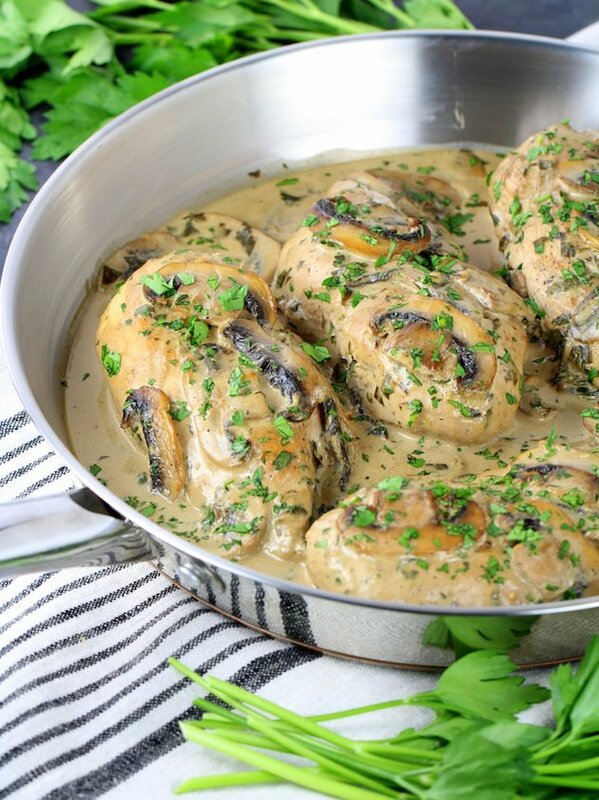 I’m going to have to save this recipe because mushrooms are my husband’s absolute favorite! Truly, an amazing recipe. And the photos are stunning! 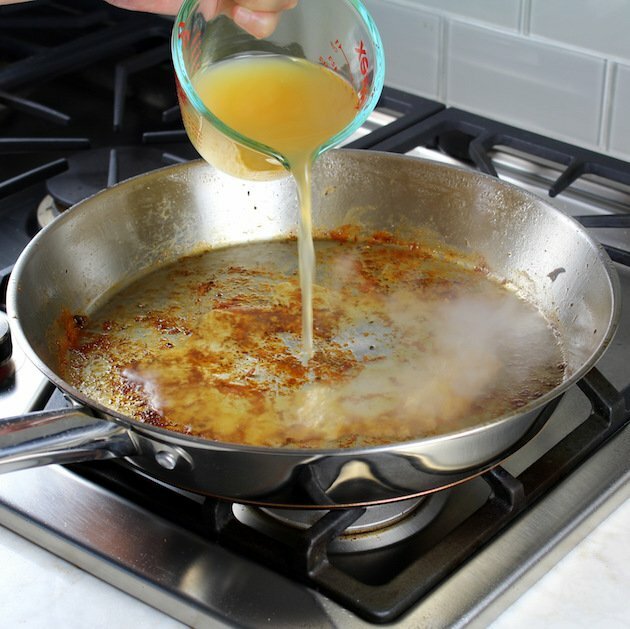 We loved that you added 2 tablespoons of Worcestershire in this! 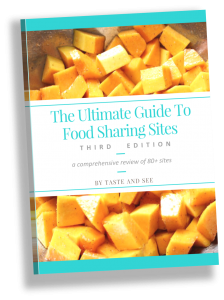 Can’t wait to give it a try, pinned! Thank you so much! I feel like the Worcestershire sauce is the secret ingredient! Plus, it has the same savory umami flavor as mushrooms so it just seemed like the perfect addition. Thanks for dropping by with the kind words!